A little treat for all the dads this Father’s Day, or for anyone wanting to escape the World Cup – actually, for all fans of 80’s music, whether or not you’re celebrating your paternity or avoiding the football frenzy – the kindle version of More Eighties will be FREE on Amazon this coming Sunday and Monday. For those readers who don’t own a kindle, simply download the free kindle app to read the book on devices including PC, mobile and laptop. The third and final book in a trilogy on Eighties’ popular culture, More Eighties explores how the decade provided a backdrop against which creativity and individuality flourished, the social and political factors which shaped the music of a generation, the changing role and influence of record companies, and why the era remains a golden age for so many of us. David Ball – Soft Cell – Martyn Ware – Heaven 17 – Dave Wakeling – The Beat – Pauline Black – The Selecter – Eddi Reader – Fairground Attraction – Rusty Egan – Visage – Jona Lewie – Suzi Quatro – Andy Kyriacou – Modern Romance – Nathan Moore – Brother Beyond, and Junior Giscombe. Reflecting the diversity of the UK charts during that time, this book offers recollections, insights and observations from those at the forefront of British music during the most exciting, transitional period in its history. With a foreword and commentary by Peter Coyle, former lead singer of the Lotus Eaters, songwriter, and the man responsible for introducing karaoke to the city of Liverpool, completing the eclectic mix. If you could leave a review on Amazon when you’ve finished More Eighties, that would be great. Not only does your feedback help me with my future writing but it improves the book’s visibility on Amazon (don’t ask me how – their algorithms are beyond my comprehension! ), meaning more fans of the decade are likely to find it. 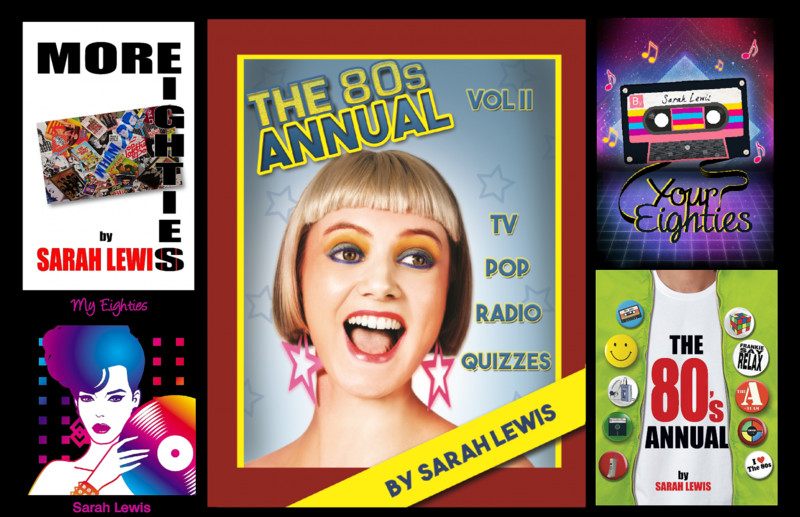 Tomorrow sees the launch of the third and final book in my trilogy on 80’s popular culture, More Eighties. Available in paperback or kindle version, the book ex plores how the decade provided a backdrop against which creativity and individuality flourished, the social and political factors which shaped the music of a generation, the changing role and influence of record companies, and why the era remains a golden age for so many of us. Reflecting the diversity of the UK charts during that time, More Eighties offers recollections, insights and observations from those at the forefront of British music during the most exciting, transitional period in its history, and features interviews with David Ball (Soft Cell), Martyn Ware (Heaven 17), Dave Wakeling (The Beat), Pauline Black (The Selecter), Eddi Reader (Fairground Attraction) Rusty Egan (Visage), Jona Lewie, Suzi Quatro, Junior Giscombe, Ian Donaldson (H2O), Karel Fialka, Andy Kyriacou (Modern Romance) and Nathan Moore (Brother Beyond), along with a foreword and commentary by Peter Coyle, former lead singer of the Lotus Eaters, songwriter, and the man responsible for introducing karaoke to the city of Liverpool, completing the eclectic mix. Having recently received and read his copy, Peter remarked that More Eighties “is a gem of a book”. I hope you will think so too. To mark the book’s release, I will be having a celebratory ‘launch lunch’ tomorrow with friends, whose support has been invaluable during the writing of More Eighties, followed by more radio interviews later in the week. Details and photos to follow on social media. Few authors will confess to having a favourite amongst their own books. It’s almost an unspoken rule that such an admission is akin to admitting to having a favourite child. (On the off-chance either of my kids are reading this, I love you both the same!) However, with the forthcoming publication of my next book, I can show no such impartiality in my work, as this has been the most interesting, rewarding and fun to research and write. The final book in my trilogy on Eighties’ popular culture, More Eighties will be published by Fabrian Books on 16th May, 2017. Featuring interviews with Eighties’ artists including Dave Ball, Martyn Ware, Pauline Black, Dave Wakeling, Eddi Read er, Suzi Quatro, Rusty Egan, Jona Lewie, Junior Giscombe and Nathan Moore, the book explores how the decade provided a backdrop against which creativity and individuality flourished. The role and influence of the record companies is also examined, along with a look at why music from the era has not only endured but grown in popularity. In addition to contributing his insights, anecdotes and recollections of the Eighties, former Lotus Eaters lead singer Peter Coyle has written the foreword for More Eighties, perfectly capturing the core of the book’s objective. Another reason this book is top of my list. I will keep you posted about details such as when it becomes available for pre-order and outlets, but I am happy to be able to reveal the cover for More Eighties today. Look out for it coming your way soon.